On the 12 day Kenya and Tanzania Safari Tours the aim is to take you to some of the most famous national parks in Africa. Now you can see all the wild animals and locations as you see them on the Discovery Channel and National Geographic. 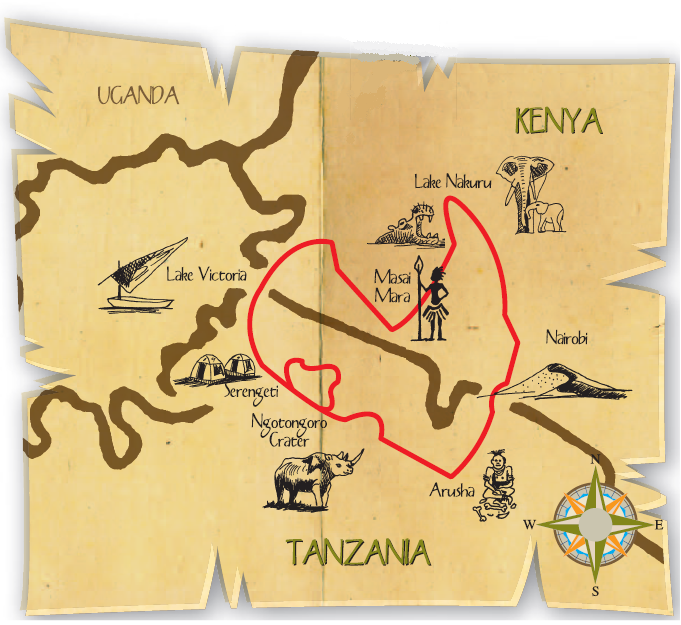 We also visit some of the lesser known highlights of Kenya and Tanzania. This overland adventure tour offers a great combination of safaris, nature and culture. Included highlights: Nairobi, Great Rift Valley, Mount Longonot, Hells Gate, guided walks, Lake Naivasha, Masai Mara, Lake Victoria, Serengeti National Park, Ngorongoro Crater, Masai Village, Arusha. 1. Camping: Clients mostly overnight in comfortable two-man dome tents, with built in mosquito nets and of course a camp bed/ stretcher… and a couple of nights are upgraded to budget rooms. Excluded: Flights, all items of a personal nature, alcohol, snacks, souvenirs, tips and optional activities etc. Arrive in Nairobi and meet at our hotel in the heart of this bustling city. For clients arriving early, there are a variety of optional tours and excursions on offer – these can be arranged on arrival at the Hotel. At 18:00 we conduct a pre-tour briefing before enjoying an own expense dinner at a local restaurant. The Kenya and Tanzania Safari Tours depart and end in Nairobi. Leaving the city behind us, we travel north, climbing continually to the lip of the escarpment from where we will enjoy a fantastic view of the Great Rift Valley. After a short stop to enjoy the views, we make our way down the Rift Valley escarpment to visit the Mount Longonot Volcano. This afternoon we have time for a hike in Mount Longonot National Park where we have an incredible view over the whole escarpment, with the chance of viewing some wildlife along the way. A packed lunch will be provided for the hike. After enjoying the majestic scenery the Rift Valley has to offer, we take a short drive to our campsite situated on the shore of Lake Naivasha to set up camp, relax and enjoy dinner around the campfire. We enjoy breakfast in camp before starting a day filled with activities. We start by travelling the short distance to the famous Hells Gate National Park, where we have the opportunity to explore the high basaltic cliffs of the park with the chance of seeing zebra, giraffe, buffalo and other species of antelope found in the park. (Guests have the option to explore the park on bicycle). After our trip down into the gorge, we make our way back to camp for lunch followed by a boat cruise on Lake Naivasha to find hippo and the numerous bird species that inhabit the area. Today we traverse through some of Kenya’s finest wilderness, using lesser known roads, we will pass numerous Masai villages on the way. We spend the next two nights in comfortable accommodation along the banks of the Mara River on a private concession adjacent to the renowned Masai Mara National Park. We conduct extended game viewing trips (looking for wild animals) in this area. Early this morning we depart on a full day of extensive game driving (safari). The Masai Mara is well known for its large herds and ever-present predators. Lunch today will be a picnic on the banks of the Mara River, known for its huge crocodiles and hippo population. We return to our Lodge for the night and enjoy the beautiful scenery surrounding us. Leaving the Masai Mara behind us, today we enter Tanzania and then descend toward the shores of Africa’s largest lake, Lake Victoria. This Lake forms part of the Great Rift Valley and provides a livelihood for the many locals that fish its waters. We will spend some time here before we enjoy an own expense dinner at a local restaurant. Camp the night at the water’s edge. Today we enter what is arguably the world’s most acclaimed wildlife sanctuary, the Serengeti National Park. This Park with its huge concentrations of plains game, numerous predators and prolific birdlife all resident on the seemingly endless grass and acacia covered plains epitomizes Africa’s game parks. We will traverse the Park west to east doing extensive game drives, and will spend a night at the active Seronera campsite. Rising with the African sun we prepare for a full day of exploring the park. We spend as much time as possible on safari in the park and our guide will take time to explain the behaviour and habits of the animals we encounter. With regular comfort breaks and a picnic lunch, we make this most out of our day in this fascinating park. Tonight we setup camp in the park and enjoy a delicious meal prepared by the guide. After an extensive morning safari, we leave the Serengeti and enter the Ngorongoro Conservation area. Here you will witness the spectacle of the Masai tribal people herding their cattle amongst the wildlife, still living their customary lifestyle as they have for centuries. Tonight we will camp at the renowned Simba camp on the edge of the Ngorongoro crater. The views from the camp are spectacular. It will be an early start as we set of at first light. We make the daring descent into the Ngorogoro Crater in our smaller 4×4 safari vehicles and here we explore this marvel of nature with its sheer walls and fertile plains. With the possibility to view almost all of Africa’s mammals, including the rare Black Rhino at close range in open plains, this has to be the finest game viewing available. Returning to Simba camp, we enjoy lunch before exiting the park and descending the escarpment to our camp. Here we camp for the night amongst the Masai people in an established village. We wake up to the bustling noise of village life and after breakfast we make our way towards Arusha, the town at the foothill of the beautiful Mount Meru. Here we will spend the afternoon exploring this lively town and its local markets. Tonight we will enjoy an own expense meal at a local restaurant. After breakfast we set off to complete the circle back to Nairobi. (On occasion we may use the shuttle bus to transfer clients.) This road travels through some spectacular scenery and on a clear day offers stunning views of the mighty Mt. Kilimanjaro, Africa’s highest mountain. En-route to Nairobi city, the transfer will pass via the airport to facilitate clients who are flying out today. Clients staying on in Nairobi or continuing their travels will be taken into the city centre. Please note: The day by day descriptions published are intended as a rough guideline only. Adventure travel by nature is unpredictable, weather patterns, game migrations, road conditions and a multitude of other factors may necessitate itinerary changes that ultimately are for the client’s benefit. It is essential that clients are flexible and open minded in this regard.